Laura and I decided that to get a good idea of what a city has to offer, we should try at least three different types of restaurant in each area. We decided to start with Seekonk, so last week we went Mexican (Laura's favorite cuisine) and ate at Tito's Cantina (see review here). This week, I got my chance with my favorite cuisine (Italian) and we visited DiParma Italian Table. It's located in the old Darling's building at the Ramada and brought back a lot of pleasant memories of that now gone favorite. We arrived on a chilly afternoon at around 3:10 p.m. A few tables were occupied but it was mostly quiet. We were seated immediately and approached by our server, Michael. He asked if we were there for lunch and we said yes. Now here's where Laura and I disagreed. I assumed we could only order from the lunch menu because it was before 4 p.m. But Laura figured because the menu also included the dinner choices, we could have ordered those selections. I probably would have gone dinner if I'd thought it was an option, but I chose from lunch. SIGH. Anyway, Michael took our drink order - two Diet Pepsis - and returned with a basket of rolls. We were still deciding on our lunches and Michael explained how the lunch portions were smaller and came with different options than the dinner selections. This also convinced me I had to choose from the lunch menu (I later found out I was wrong when Laura actually called to find out). SIGH again. We were all hyped up to order their homemade potato chips as an appetizer. We saw them listed on their online menu. 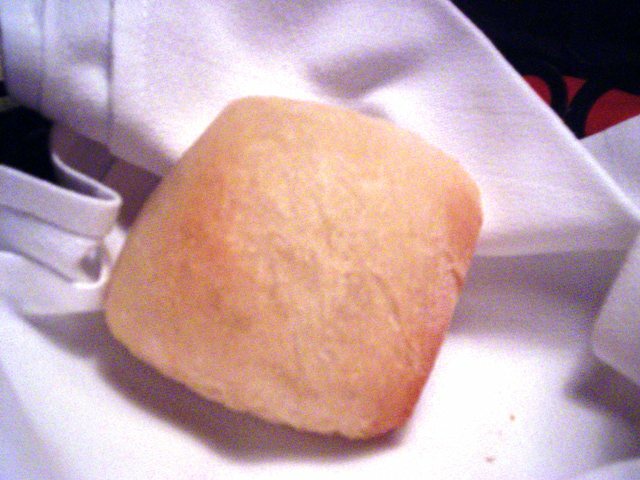 We were very disappointed to see them no where on the house menu, so we just stuck with the rolls. There was more than one, but we'd already eaten them. Laura finally decided to get the individual Hawaiian Spice pizza. 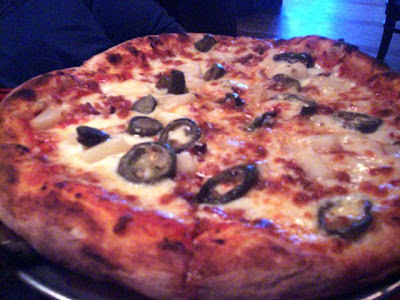 It contained applewood smoked bacon, roasted pineapple, and jalapenos. When it was placed in front of us, you could smell it before Michael put it down. Laura declared it spicy and delicious. She even loved the crust, which she usually doesn't finish. I decided to start with a bowl of soup, which was offered with lunch entrees for only $1.99. 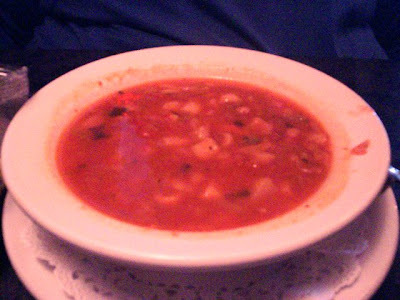 I got my favorite minestrone and the bowl was substantial and the soup was fantastic. It came with little oyster crackers which I happily floated on top. What a great start to my meal. 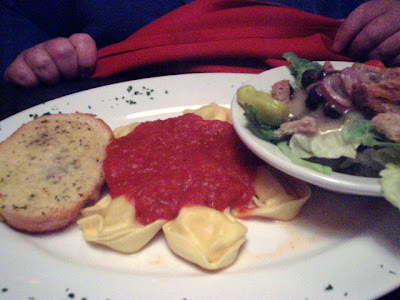 For my entree I ordered cheese tortelloni with marinara sauce. I originally was going to order the bolognaise sauce but Michael said a mistake on the menu didn't show that the meat sauce was $3 extra. I didn't think it worth it so I stuck with the marinara. I was glad I did. It was so light, fresh, and delicious. The tortelloni pasta was amazing. Freshly-made sure makes a difference from the boxed or frozen we're used to. They were filled with ricotta cheese and not at all watery when cut. This is when I wished I'd ordered the dinner portion. I wanted more, lol. As it were, I had about six large tortelloni, a small salad, and a slice of garlic toast. The whole meal was terrific. Everything was so well prepared. 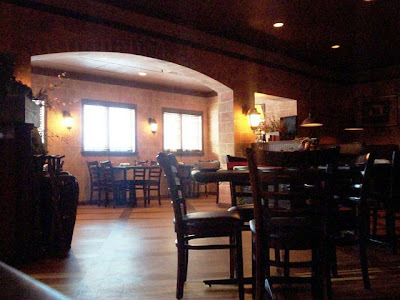 DiParma has everything you'd want from a fine Italian restaurant. Pizzas, pastas, beef, seafood, and poultry dishes. They also carry soups, sandwiches, and salads and offer a dessert menu. The whole Seekonk menu is online here. You might want to be careful though. We found a few differences between their house menu and online menu (remember, no chips). But don't worry, their menu is extensive and I know you'll have no trouble finding something tasty. Actually, the problem will be narrowing down what you want. With 20% tip, we left $33 for Michael. Although he was very attentive throughout the whole meal, he seemed to have forgotten about us at the end. However, we were able to catch his eye when we stood up and started putting on our coats. 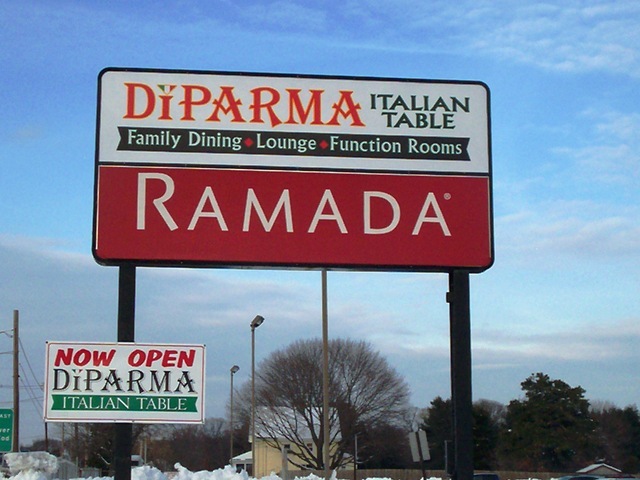 DiParma has been in business for over three decades and has its original location down the Cape. 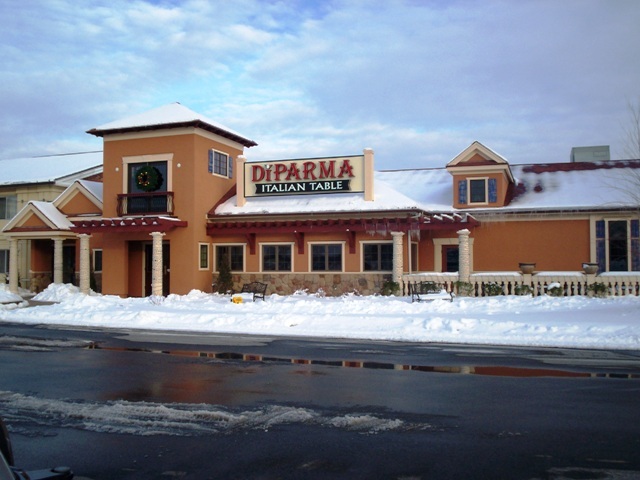 Besides serving the public for lunch and dinner, DiParma is also available for weddings, functions and events. The DiParma in Seekonk is open daily from 11:30 a.m. to midnight (lunch is served until 4 p.m., dinner is served until 10 p.m., and pizza and appetizers are served until midnight). 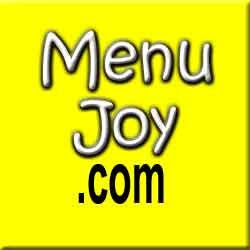 Don't forget to check out MenuJoy.com for great area restaurant menus!